Chelsea have opened the scoring against Crystal Palace this afternoon with a surprise combination coming together at Selhurst Park. 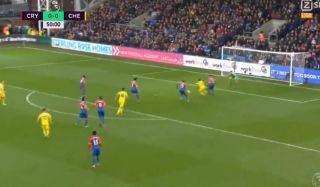 Watch the goal video below as David Luiz steps forward to pick out a superb killer ball to pick out N’Golo Kante, who takes a fine touch before steering home. The France international has been given a more attacking role at Chelsea this season, and manager Maurizio Sarri will be delighted to see his controversial tactic come to fruition here. In what has been a largely dull game, this moment of quality has really sparked the match into life – here’s hoping for more like this!